Awesome bracelet for my 25 year old nephew, great quality. It exceeded expectations, and the parcel was definitely packed with care. The product was identical to that advertised, the quality is excellent & fits perfectly, The delivery window was spot on, a good buying experience, thank you! All leather bracelets are in stock. 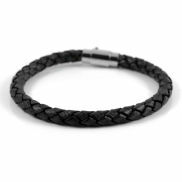 The wonderful scent of our genuine cowhide men's leather bracelets is just one part of their allure. Just click on any of the product images below to find your perfect new bracelet. 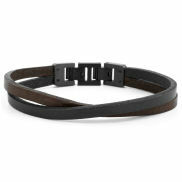 On this page you will find our wide selection of leather bracelets. Leather is a very dynamic natural material that shows imperfections here and there in the pattern of its grain. This helps to give the bracelet a little more soul than other non-leather bracelets. A leather bracelet will stretch somewhat while you use it, so make sure not to wear it too tightly when you first obtain yours. We have many different types of bracelets for men: wide, merged, braided, triple wrapped and combined with beads. The quality of any leather product, including bracelets, can be divided into two very broad categories. Split leather is the least desirable quality and refers to leather that is split or separated into multiple layers from a thick hide, so it is not the outer layer of the hide. An artificial layer is applied to the surface of the split leather that is then embossed with a fake leather grain. Full grain leather is a term for the opposite of split leather. It is the outer layer of the hide, the actual skin where the cow hair grew and thus preserved the natural grain. The quality of full grain leather is fantastic, producing a beautiful surface and durable products. Sometimes the grain leather name is used for both split and untanned hides, so buyer beware. At Trendhim we mostly use full grain leather. We also sometimes have to use split leather however, when a piece of leather is too small and full grain leather would be too thick to fit with the product. 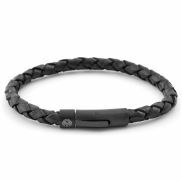 What size leather bracelet should I choose? When you measure your wrist to determine the size of the leather bracelet you should select, be careful not to wrap the measuring tape too tightly around your wrist and then add 0.8 inches to the measurement. 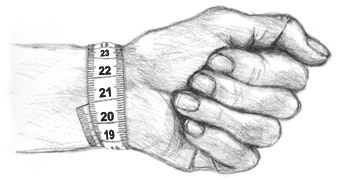 The wrist shown in the picture is 8.2 inches, so we add 0.8 inches and the proper ordering size for this wrist would be 9 . If the bracelet is for a gift and you are unable to measure the actual wrist, here are some good rules of thumb to guide you. Select the size you want using the size filter on the menu at the top of the page.